New SOD Confirmations Added to OakMapper! New confirmed cases of Sudden Oak Death (SOD) (P. ramorum) have been added to OakMapper, a project that tracks the spread of Sudden Oak Death from data collected by citizens and organizations. All official SOD cases are collected and confirmed by the California Department of Food and Agriculture or the University of California. Community SOD cases are submitted by citizens via the OakMapper website and iPhone application. 415 new points collected between 2008 and 2011 have been added to OakMapper bringing the total number of confirmed SOD locations to 1570. 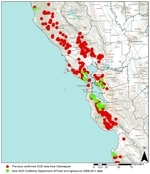 The new data consists of laboratory confirmed cases collected by the annual SOD Blitz campaigns of 2008-2010 from the Forest Pathology and Mycology Lab run by Dr. Matteo Garbelotto and also data collected by the California Department of Food and Agriculture between 2008 and 2011. Click on the images below to view close-ups of the new confirmed SOD data (in green) from the SOD Blitz and California Department of Food and Agriculture (CDFA).